Personalize with any age and 1-line message on the front along with an additional 3-line message on the back 11 oz. 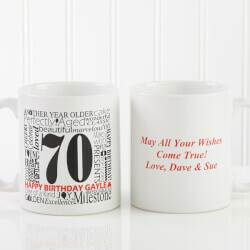 all WHITE Ceramic Coffee Mug features a classic mug shape and stands 3.75" tallMicrowave safe; dishwasher safeDesign will wrap .75 of the way around the mug.Imported Let your special friend or family member know they are perfect at any age with our Another Year Has Gone By Personalized Coffee Mug. Perfect for any birthday celebration, from co-workers to family members!